Our friends at the Center for Security Policy have issued one of their “occasional papers” on a scandal that we think is worse and more threatening to national security than the Uranium One scandal through which Hillary Clinton and Obama transferred 20 percent of America’s uranium to Russia. What could be worse than giving 20 percent of our uranium to Russia one might ask? How about giving a 35-year lease to one of America’s largest container ports, located just minutes from the Kennedy Space Center, to a Middle Eastern company with ties to Iran, North Korea, Russia and the evil genius behind Saddam Hussein’s nuclear weapons program? But that’s exactly what the same players involved in the Uranium One deal did when they leased the cargo container operations at Port Canaveral, Florida after two years of secret talks with the Obama administration. Now the Center for Security Policy’s dogged and fearless team of Alan Jones and Mary Fanning have revealed exactly what could go wrong, with potentially catastrophic consequences for U.S. national security. Jones and Fanning originally broke the news that the family of Iraqi nuclear physicist Dr. Jafar Dhia Jafar – known as Saddam Hussein’s nuclear bombmaker – along with the Emir of Sharjah, United Arab Emirates (UAE), had been awarded a 35-year lease for cargo container operations at Port Canaveral, Florida. You can read the original expose through this link. There is a U.S. government inter-agency review board called the Committee on Foreign Investment in the United States (CFIUS) whose responsibility is to conduct a thorough review of any commercial acquisition of U.S. infrastructure or property by a foreign entity that may have national security implications. This is the same interagency group that approved the Uranium One deal. Unfortunately, during a five-year period from 2009-2014, the CFIUS staff chairperson was a Pakistani ex-patriate named Aimen Nabi Mir, who has direct connections to both the Pakistani intelligence service and the U.S. Muslim Brotherhood. As we now know, it was during this timeframe that both the Gulftainer lease and the Uranium One deal were permitted to go forward by CFIUS. Thanks to the remarkable investigative efforts of Mr. Jones and Ms. Fanning, it has now come to light that the implications of the CFIUS failure to appropriately review the Port Canaveral Gulftainer deal go far beyond original concerns about this Middle East-based ports company acquiring such strategic access to all the container operations at this key port along Florida’s Atlantic coast. Indeed, Port Canaveral is near a number of important U.S. facilities—including the Navy’s East Coast ballistic missile submarine base, two U.S. Air Force Space Command bases and NASA’s Kennedy Space Center. Additionally, Port Canaveral and its container facilities are connected directly to rail and road lines that provide ready transportation access to the entire country. “The Perfect Storm: Project Pelican’s Gulftainer, Russia’s Club-K, KGB’s Primakov, North Korea, and the Architects of the Islamic Bloc and the Iran Nuclear Deal” now reveals that the danger to U.S. national security may be exponentially more critical. Dr. Jafar Dhia Jafar worked closely with the Russians on Iraq’s full range of Weapons of Mass Destruction programs, including the nuclear one. He succeeded in designing a miniaturized nuclear warhead similar to the model that North Korean leader Kim Jong Un posed with earlier in 2017. 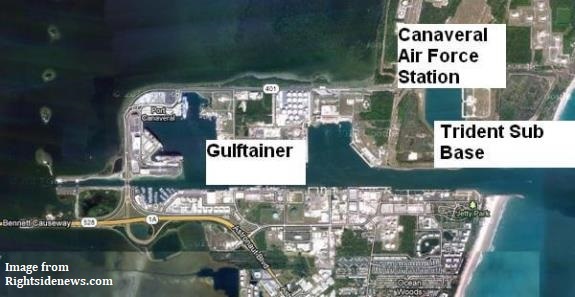 Worse yet, Gulftainer, the Iraqi-UAE company that was allowed to obtain the Port Canaveral container facility lease, has entered into a joint venture with the Russian state-owned firm which owns 100% of the shares of Rosoboronexport, the exporter of the Club-K system. The Club-K is a cruise missile launch system concealed in a container whose external appearance looks identical to standard ISO intermodal commercial cargo shipping containers. Inside each Club-K container, however, are four missiles which can carry biological, chemical, conventional, Electro-Magnetic Pulse (EMP), or nuclear warheads. The genius of the Club-K system is its ability to evade detection among the millions of shipping containers carried on ships, trains, and trucks all over the world, including inside the U.S.
Now, the Russian maker of the Club-K has partnered with the Iraqi-UAE company headed by the nuclear mastermind who designed a nuclear warhead specifically to fit on the nosecone of the Club-K cruise missile. Also, Ras al-Khaimah (RAK), one of the seven UAE emirates, runs a shipping company in partnership with Iran, which essentially controls RAK’s main shipping port. And a broken and possibly corrupt CFIUS just gave them all access to a 35-year lease on the container facilities at one of America’s most critical ports. Submitted by Smokey1977 on Wed, 02/28/2018 - 07:31. I have submitted complaints to DHS, DOJ, senators from Florida, Florida Attorney General, my two USELESS senators in North Carolina, (RINO Burr and RINO Tillis) but as of yet, I have heard nothing. HAS ANYONE SEEN THIS ON ANY MAINSTREAM MEDIA (MSM) AS OF YET? Submitted by DeanWHandy on Wed, 11/08/2017 - 12:58. It seems that our whole government has been taken over by people who don't want the USA to continue to be a "World Power" ... and who are willing, at any cost, to let those who hate us (read: United States) run the businesses and government agencies that will allow them to see to it that we are unable to do anything about it. When Donald J. Trump said he wanted to "Drain the Swamp" we all thought he had the capacity to do just that. It seems to me that the fact that we have people in our government in "GS" positions that are protected by some of the strongest rules and Labor Unions (et.al.) that it just may be impossible to rid ourselves of these people. DOES PRESIDENT TRUMP KNOW THIS? Submitted by email_registrat... on Wed, 11/08/2017 - 12:06. Is President Trump aware of this problem? If not, please arrange a meeting with him to expose it, or provide him with a link to this article. I'm getting more depressed every day.